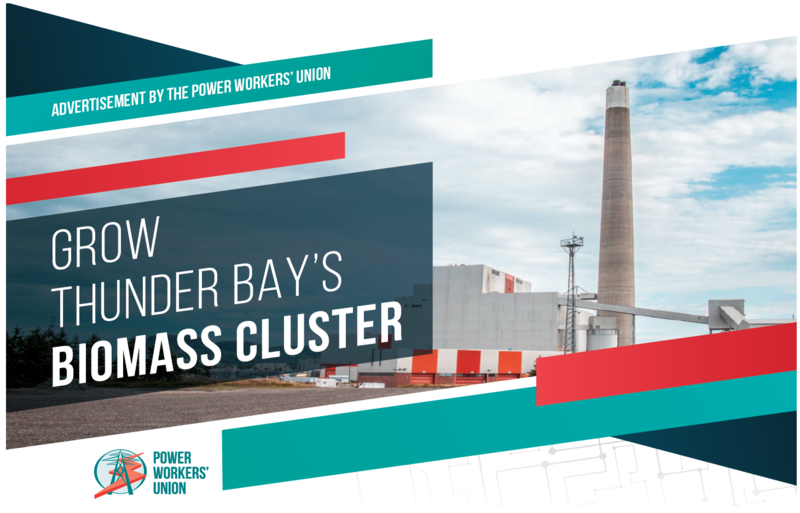 The Power Workers’ Union (CUPE 1000) believes the recent decision by Ontario Power Generation to close the world’s largest generating station to be converted from coal to advanced biomass in Thunder Bay, is short-sighted. Over the last decade, Ontario invested about $200 million (M) dollars in the region’s biomass innovation cluster, most of it for the conversion of the publicly-owned Thunder Bay and Atikokan stations to biomass. Millions of dollars were also invested in innovative biomass research at Confederation College, Lakehead University and the Centre for Research and Innovation in the Bio-economy. About 230 jobs are supported in local communities: 124 in electricity production; 50 wood pellet manufacturing: and in forestry, transportation and R&D. Taxes paid to local communities for Atikokan GS approximate $2M dollars a year and about $4M a year for Thunder Bay GS. With a contract that expires in 2024, Atikokan Generating Station is North America’s largest generating station to be converted from coal to 100% low-carbon white pellet biomass. Unfortunately, the heat output at both stations is wasted. Power contracts with Ontario’s Independent Electricity Operator (IESO) govern the operations of the two stations. While both can provide reliable base (24/7) and rapidly meet peak electricity demand, their capacity is underutilized. This under-utilization reduces purchases of locally-produced wood pellets. Sustaining these local resources ensures regional energy security for meeting forecast demand growth from remote grid connected communities, the Ring of Fire, and other mining projects in the region. OPG claims closing Thunder Bay GS will save about $40M annually. This saving does not include the substantial costs for decommissioning the facility or the lost revenue from this ratepayer/taxpayer owned asset. An independent analysis indicates that any peak capacity supply gap would likely be supplied by import-dependent, natural gas generation plants in southern Ontario, at a cost of $7M to $24M more a year. In the short-term, the PWU and others in the community are calling for the IESO contracts for both stations to be expanded and include utilization of the waste heat. Thunder Bay GS waste heat could be used in an adjacent greenhouse complex to supply fresh local produce year-round. The wasted heat could also help make wood pellets and or heat buildings. The same could be done at Atikokan. Investing in biomass generation and the dependent cluster economy is supportive of what local leaders want for the north. Such investments are also consistent with Ontario’s forestry strategy to create jobs and economic prosperity for the North and the federal government’s Prosperity and Growth Strategy for Northern Ontario. Now is the time to reverse the closure decision and move forward with a business case that secures regional energy security and economic growth while maintaining jobs in the north.